"Proof We're Not Alone? Judge for Yourself"
Jeff Peckman is a researcher from Denver, CO who is trying to get a national inquiry into extra-terrestrials and UFOs. He has appeared on “Larry King Live” and FOX News recently and also held a press conference in Denver to bring the story of Stan Romanek to the public awareness. Stan Romanek claims to have had numerous encounters and visitations through out his life from extra-terrestrials and claimed to have captured some of these visitations on video. He has documented many other encounters as well. Peckman is assisting Romanek in the hopes of getting the public to take his experiences seriously. 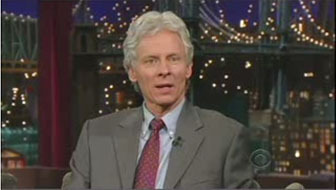 Jeff Peckman’s appearance on the Letterman show was absolutely astounding! He claimed our government has treaties with 57 different alien races (this has been confirmed by David Wilcock and many others, by the way) and he blamed the oil companies for the suppression of advanced technologies and for many of the policies that are set in Washington, D.C.
At first there was a lot of snickering and giggling in the audience, but Mr. Peckman made his case in a very intelligent, informed and rational manner, and, by the end of his appearance, no one was laughing. This was all quite shocking to see on a nationally-televised late night talk show, to say the least!